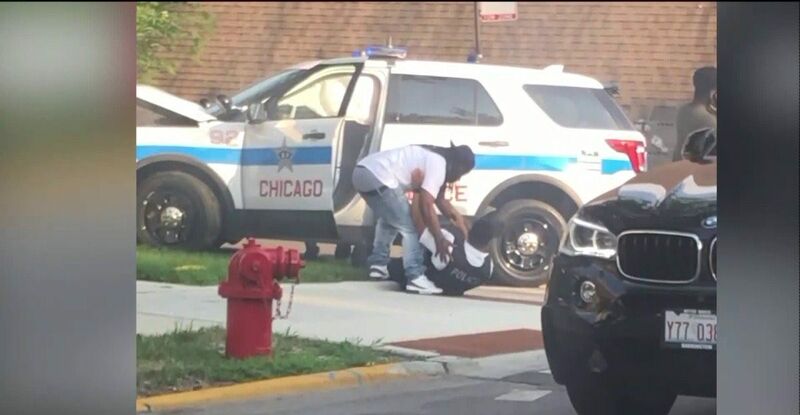 A Chicago man is being hailed as a hero after he jumped into action so he could rescue an injured police officer from a smoking car. The cop had been driving through the city’s South side with its lights and sirens on so it could get to a foot chase when another car made a turn and cut him off. Instead of hitting the other driver, the officer veered his car into a tree. An unidentified man was then seen rushing over to the smoking SUV, opening the door, and pulling the policeman out of the vehicle. Several other good Samaritans rushed to the officer’s aid as well. Kevin Russell was in his car when he saw the scene unfolding. Touched by the man’s compassionate response to the accident, he filmed the exchange and posted the video to Facebook. Since Chicago’s South side community is often mistrustful of police officers, the rescue has spurred an emotional response from social media viewers. “I was really able to capture the real heart of the South side of Chicago and the citizens in the city of Chicago,” he added. According to the Chicago Police Department, the officer was taken to the hospital and is expected to make a full recovery from his injuries.